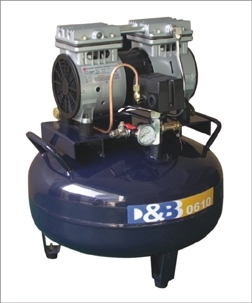 JW series free-oil air compressor is our company newest one pattern swaying free-oil compressor. It composes of compressor, air container, press-control switch, pipeline point, electromagnetism value and inhaler ect . Free-oil compressor relys on the self-lubricate material which composed of piston ring, guiding ring,jarect . Self-lubricate material refers to small friction coefficient-polymer .Polymer contains solid lubricate and complexion polymer material .And this material composes of relative macromolecule material which is provided with especial structure .It can achieve low friction coefficient effect. Our company aims at spreading free-oil compressor to dental application .Let more dentalists and oral patients know the necessary of our fee-oil compressor. 2. Free-oil compressor used in dental equipment. It guarantees it is needless for any oil during curing, glass hydronium, bake porcelain that can achieve perfect cure effect .It also prevents oil air and carbon entering into the month by compressing air with oil . 3. With big size, high, hard cleanness oil molecule and carbon from, oil compressor makes the axletree of the dental units fray, even leads the dental units to go wrong and being short life. Comparing with oil compressor, free oil is more convenient in maintenance and operation. Such as :oil compressor need to add oil before operate as well as considering the temperatures .Without oil, the dental unit will be scarp; For a long time operation, the pipeline of the dental units will be aging and leads to any others failure.